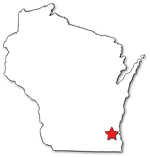 A: : Waukesha is an older, developed city that is part of the Milwaukee metropolitan area. It lies about 17 miles west of Lake Michigan and 1.5 miles from the Great Lakes Basin surface water divide. The City of Waukesha is the county seat of Waukesha County. As the primary urban area for the county, it is home to a historic downtown, a mass transit system, and an established community of increasing diversity. A visitor to Waukesha would see sites similar to those in other small cities throughout the Great Lakes basin. Back to top. Q: Why does Waukesha need Great Lakes water? A: Waukesha’s water supply does not comply with safe drinking water standards and is environmentally unsustainable. The existing water supply – a deep aquifer – is severely depleted, due in part to a natural formation (a thick layer of shale rock) that restricts rain and snowmelt from recharging it. As the water levels have decreased, naturally occurring contaminants such as radium have increased. Long-term use of the aquifer is not sustainable, and continuing to pump it until exhaustion would be environmentally irresponsible. Waukesha’s secondary water source is shallow groundwater wells. Adding new shallow groundwater wells would have permanent environmental impacts on valued brooks and streams, as well as nearby wetland habitat in environmentally sensitive areas. Back to top. Q: What caused the depletion of Waukesha’s water supply? 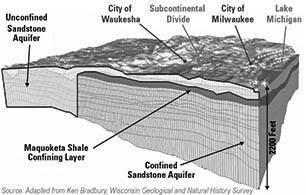 A: A thick layer of shale rock restricts recharge of Waukesha’s primary water source, the deep aquifer. 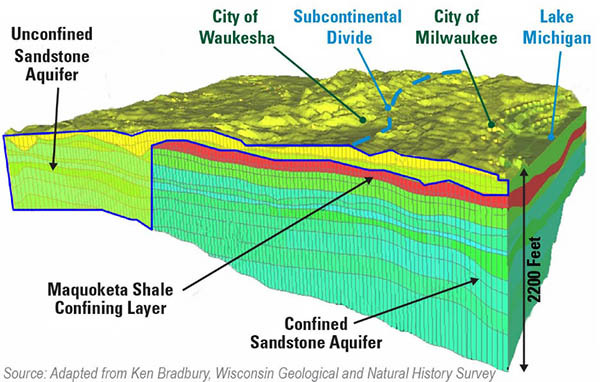 This shale layer covers much of southeastern Wisconsin (including Milwaukee, Racine, and Kenosha Counties, as well as most of Waukesha County). The limited recharge of rain and snowmelt to the deep aquifer has contributed to depletion of the aquifer. The depletion is also the result of decades of pumping by multiple municipal water systems and industries all across southeastern Wisconsin. Waukesha’s leaders recognized this lack of sustainability and have examined water supply alternatives for decades. They have determined that Lake Michigan is the only reasonable water supply alternative. Back to top. Q: Why wouldn’t Waukesha just install new treatment systems for its radium issue? Adding more radium removal systems to deep aquifer wells and developing more shallow wells does not address the primary issue – providing the City with a long-term, sustainable and reliable water supply. In addition to radium, groundwater quality issues include high total dissolved salts (TDS) and strontium in the deep aquifer, and arsenic in the shallow aquifer. Treatment systems to remove these contaminants would be energy intensive and generate concentrated waste pollutants that are difficult to treat and dispose of. The volume of water used by such systems would more than offset the volume saved through the city’s conservation program. Unlike groundwater options in the area, a Lake Michigan water supply is environmentally sustainable because Waukesha will recycle all of the water volume back to the lake. The Great Lakes option is the only reasonable alternative because it is the best way of protecting public health and the environment for the long term. Back to top. Q: Would more water conservation programs prevent the need for Great Lakes water? A: No. While water conservation is important in satisfying both Waukesha’s water needs and the terms of the Compact, it cannot save enough water to avoid the need for a sustainable water supply. Waukesha will continue to be a leader in water conservation. It has already adopted the first daytime ban on sprinkling, the first conservation rate structure, and the first toilet rebate program in the state. Waukesha also remains committed to ongoing public education and outreach about both existing and expanded conservation efforts: The City’s goal is to achieve significant and measurable water savings by 2050. Continued reliance on groundwater, however, would require water and energy-intensive treatment for the removal of contaminants such as radium, total dissolved salts (TDS) and strontium from the deep aquifer, and arsenic from the shallow aquifer. The volume of water wasted would exceed the volume of water saved through conservation. Back to top. Q: Will Waukesha use Lake Michigan water to fuel the development of new homes or businesses? A: No. The City of Waukesha is largely developed. Population growth will be very limited, and new development will be predominantly infill. The approval of Waukesha’s application legally limits the geographic footprint of Waukesha’s water supply area primarily to the city. Less than 3% of the approved service area is outside the city limits, including 26 acres in Pewaukee that are already served by the city, as well as town “islands” – also currently served – that are surrounded by the city. Waukesha needs a new water supply to sustainably meet the needs of existing residents, not to support additional growth.